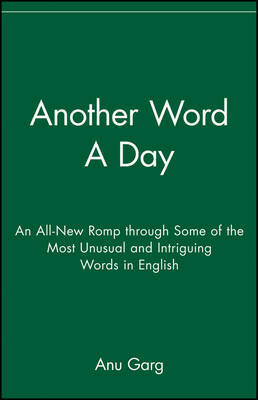 In this delightful encore to the national bestseller A Word A Day, Anu Garg, the founder of the wildly popular A Word A Day Web site (wordsmith.org), presents an all-new collection of unusual, intriguing words and real-life anecdotes that will thrill writers, scholars, and word buffs everywhere. Another Word A Day celebrates the English language in all its quirkiness, grandeur, and fun, and features new chapters ranging from ""Words Formed Erroneously"" and ""Red-Herring Words"" to ""Kangaroo Words,"" ""Discover the Theme,"" and ""What Does That Company Name Mean?"" In them, you'll find a treasure trove of curious and compelling words, including agelast, dragoman, mittimus, nyctalopia, quacksalver, scission, tattersall, and zugzwang. Each entry includes a concise definition, etymology, and usage example, interspersed with illuminating quotations. ""Anu Garg's many readers await their A Word A Day rations hungrily. Now at last here's a feast for them and other verbivores. Eat up!"" ""AWADies will be familiar with Anu Garg's refreshing approach to words: words are fun and they have fascinating histories."" In this delightful encore to the national bestseller A Word A Day, Anu Garg, the founder of the wildly popular A Word A Day Web site (wordsmith.org), presents an all-new collection of unusual, intriguing words and real-life anecdotes that will thrill writers, scholars, and word buffs everywhere. Another Word A Day celebrates the English language in all its quirkiness, grandeur, and fun, and features new chapters ranging from "Words Formed Erroneously" and "Red-Herring Words" to "Kangaroo Words," "Discover the Theme," and "What Does That Company Name Mean?" In them, you'll find a treasure trove of curious and compelling words, including agelast, dragoman, mittimus, nyctalopia, quacksalver, scission, tattersall, and zugzwang. Each entry includes a concise definition, etymology, and usage example, interspersed with illuminating quotations. "AWADies will be familiar with Anu Garg's refreshing approach to words: words are fun and they have fascinating histories." 1. Words to Describe People I. 2. Earls Who Became Words (or Places That Became Words). 3. Words Having Origins in Chess. 4. Words That Appear to Be Misspellings of Everyday Words I. 7. Words about Books and Writing. 8. Words Borrowed from Yiddish. 9. Terms from the World of Law. 10. Words That Appear to Be Misspellings of Everyday Words II. 11. Words Borrowed from Arabic. 16. Discover the Theme I. 17. Terms Employing Various Nationalities. 18. Words with Double Connections. 19. Words Related to the Calendar. 22. Words Related to the Human Body. 23. Words Related to Buying and Selling. 25. Words That Have Changed Meaning with Time. 28. Words Borrowed from Other Languages. 32. What Does That Company Name Mean? 33. Words with Interesting Etymologies. 34. Words to Describe People II. 35. Words about Collecting and the Study of Things. 36. Words from the World of Law II. 37. Words Derived from Other Languages. 38. Words about Words II. 39. Words Borrowed from African Languages. 40. Metallic Words Used as Metaphors. 41. Words Related to Movies. 42. Discover the Theme II. 44. Words That Aren’t What They Appear to Be. 45. Words of Horse-Related Origins. 46. Words of Horse-Related Origins II. 47. Words with Origins in War. 49. Words to Describe Your Opponents. 50. Discover the Theme III. 51. Words Borrowed from Native American Languages. Web Resources: More Fun with Words. ANU GARG is the founder of wordsmith.org, an online community of more than 600,000 word lovers in 200 countries, now in its twelfth year. He is the author of the bestselling book A Word A Day (Wiley). Garg speaks frequently about words and language internationally.